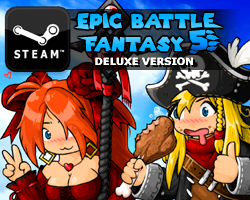 This entry was posted in Epic Battle Fantasy 4, Game News on February 5, 2014 by Matt Roszak. Looks nice.It seems that Heaven’s Gate became a weapon of all EBF series,because it’s almost appear in every your game. Yeah,I know :smirk:. I sometimes visit EBF wiki.I wonder if you could start writing articles about Battle Mountain and its bosses(Armored Oak,Diamond Golem,Praetorian MkII,Rainbow Rafflesia and Dark Players).I’m quite curious about them,because I could not buy the Premium Pack(It’s not affordable for me ). I don’t have premium pack myself. I am not exacly fluent with money atm so I am just waiting for steam version. But I hope guys with premium will write something. I’m only getting more and more hyped for this game, seeing even small notices like this makes me wish I knew when it’d be up (unless I blanked out and missed when you said, only recall mentioning it might be out in a month or so). Put off playing the updated version on Kongregate so I can throw more money at the Steam release and be surprised at all the new things. Makes me even uncertain that it was drawn in Flash. Moving to raster graphics, I see? I want to hide the Flash-ness. I’ve had to get used to this symbol.. 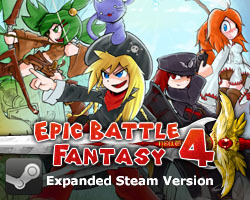 I actually preferred the original title screen, but this still looks really great, and if I didn’t see the original title screen I would say this is the iconic symbol of EBF4.